As you drive down Kotturpuram, it is difficult to ignore the massive behemoth that will loom up. What is most striking about the structure is the modern design. You do not see such structures in India; it seems to have been magically transported from New York or London or Tokyo. At first glance, you would think it’s another monument dedicated to some great Tamilian personality or politician; it even seems to look like the place where government secrets are housed. The glass edifice, clinically clean green lawns, open air amphitheatre resembling a Roman theatre, a cafe and eight floors of a plethora of books, magazines and periodicals—it’s a bibliophile’s wildest fantasy come alive! There’s much to be said about the architecture of the library. Designed by architect, C R Narayan Rao, and constructed by East Coast Construction and Industries (ECCI), each section of the library is designed to suit the various categories of books housed there. For instance, as you enter the children’s section, you are greeted with a cosy atmosphere, where colourful small chairs and children’s books of different shapes, sizes and lengths pepper the area. A large artificial tree dominates the centre of the room with colourful table and chairs surrounding it; this is the children’s fun activity area. Outside, in the balcony is a little play area for the little ones. The reading areas in every section are located near windows allowing in just the right amount of heat. “What I like most about the library is the infrastructure. For a public library, it is very large. Every library is unique but this one is different altogether. I have never seen any library have so many floors,” says Kavitha (name changed), an employee at the library. “Of its many facilities, the library allows the public to bring their own books. This is not the case in any other library, even in the previous place [Connemara Public Library] where I worked,” she adds. This uniqueness itself is what attracts the 1,000–1,500-odd visitors to peruse the services of the library. “Researchers, students, people appearing for competitive exams as well as people who read the newspapers regularly come here. A lot of engineering students from IIT and Anna University visit the library because it has many of the expensive books that they need to refer to,” says S Karthikeyan, Library Information Officer. Karthikeyan says that each section has been structured bearing in mind ease of access for the public. For example, being the most visited area, the newspaper and periodicals section is housed on the first floor so that even the old and differently abled can easily access it. He further states that the library has an exclusive Tamil section with about 24,000 books. “We also have a Braille section where there are about 1,000 registered users from Tamil Nadu as well as from outside the state,” he says. Established in 2010 by former Chief Minister M. Karunanidhi, the library was constructed to commemorate the 100th birth anniversary of C N Annadurai. However, in 2011, when Jayalalithaa came to power, she ordered the 230 crore library building to be shifted to Nungambakkam and a paediatric hospital to be constructed in its place (Jayalalithaa’s decision to shift Anna Centenary Library stayed by court, Times of India, November 4, 2011). A PIL was subsequently filed in the Madras High Court and ever since then the issue has been in limbo. Karthikeyan says that the pending court case has caused a number of problems for the library—the staff are not confirmed; books, periodicals and other publications are not renewed; there is no membership so there is no borrowing or lending. “Earlier, before the problem with the court, we used to have many children’s programmes,” says Kavitha. However, despite this, the library continues to draw its usual share of visitors. Employees too are satisfied. “There is no membership here, despite that the atmosphere here is different. It is well maintained. The housekeeping staff work all the time to ensure its upkeep,” says Kavitha. Despite its problems, the library is efficiently managed by a management team of professionals. All employees have a minimum qualification of a Master’s in Library Science. There is a process through which the employees are chosen. First, applicants have to appear for an exam organised by the Teacher’s Recruitment Board. Once that is cleared, candidates are shortlisted for interviews. Many people apply, few are chosen. “That is how I got recruited. I have been working here since 2010 and I am very satisfied with the working conditions here,” says Kavitha. “We cannot find this kind of infrastructure in other cities. 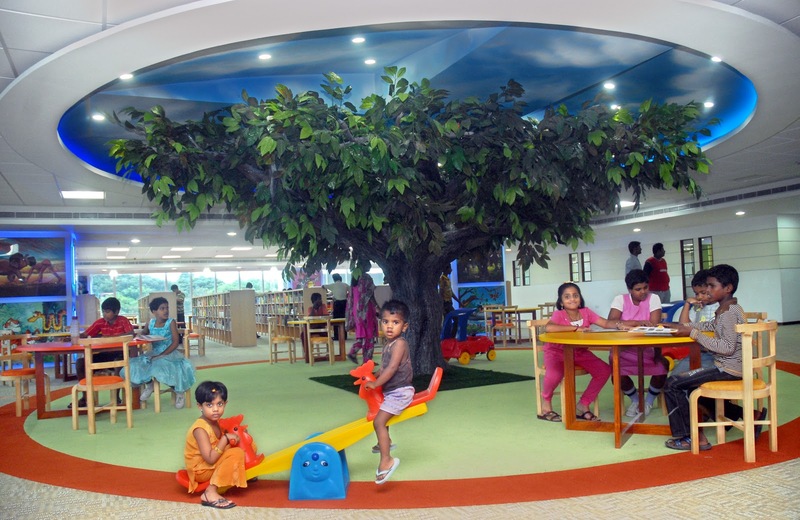 I have been to various districts, Coimbatore, Delhi; I think it is one of the finest libraries,” says Ramakrishnan. Being the largest library in India with state-of-the-art facilities, it would indeed be a tragedy if the library were to be shifted elsewhere. Glad to hear about the grand library. Thanks for the post.